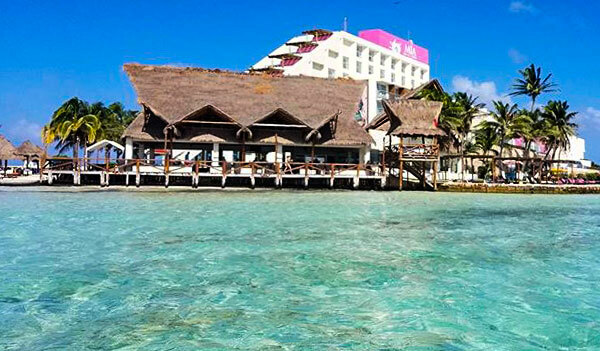 The Mia Reef All Inclusive Isla Mujeres primes a beachfront location within an exclusive private island off the coast of Cancun, Mexico. With 163 trendy contemporary design with Mexican art rooms and suites , the hotel also has two pools, one of them a natural reef formation (sea-aquarium) the best beach on the island, and two a private and secluded location for the wedding of your dreams .At first glance , the perfect place for your picture perfect photo and where guests can be relax at their best and experience a magnificent event. Mia Reef also offers great choices for Food connoisseurs where our chefs struggle to pleasantly surprise our clientele palate with innovative and avant-garde haute cuisine in places like La Cevicheria de Amador, with delicious mouthwatering signature ceviche & seafood delicatessen, Restaurant Sarimar , where international tailored menues are served and Restaurant Las Marias , where royal ancient Mayan dishes can be tasted in a delightfully decorated ambiance.